I’m going to take a short break from the secret societies and international banking cabals and cover a little known, but a charming fact about Phoenix, AZ. The Peach-faced lovebird, also called the Rosy-faced lovebird. If you grew up in the north valley in the 1980’s (north of the Phoenix Mountain Preserves) and spent any amount of time in your backyard or out riding your bike (this is before cell phones) you are probably familiar with the peach-faced lovebird. Growing up we had three of them who frequented the eucalyptus tree in the backyard and always thought they were someone’s parakeets who’d simply flown the coop. These were the days before internet and nobody thought to investigate much, but there they were, and we were content to just watch them from our covered patio as they made their way through every day. It would be a few years later that I would learn these social birds were actually peach-faced love birds and that in the mid-1980’s one of the several aviaries in the north Phoenix area had intentionally released a substantial population of them into the wild. And what a fabulous idea this was. Apparently, this was well thought out and he released a large enough flock to establish a breeding population. They made their way into the neighborhoods and city mountain preserves; and like Eucalyptus trees, mid-westerners, and many other forms of non-native biology here in the Salt River valley, these little birds took root and thrived. By the mid-1990’s these flocks were being spotted from Glendale to Apache Junction and had successfully populated much of the Valley of the Sun. The attention they received from being spotted in the neighborhoods spurred many residents to acquire some of these birds as pets of their own, and as you can imagine many more people later released their broods into the wild as well. At least this is the prevailing theory of the AZ fish and game department as well as local ornithologists. It seems the aviary owner who initially released them into the wild had a pretty good idea of what he was doing. The love-bird is a native of the dry wooded country of southwestern Africa. Although its habitat is poorly known, it generally ranges below 1500 feet and is found from Angola, then south along the coast through Namibia to the Cape province of South Africa. Like many desert dwellers, it requires an arid habitat with free access to water. Wow, this sounds just like Phoenix, no wonder they thrive here. 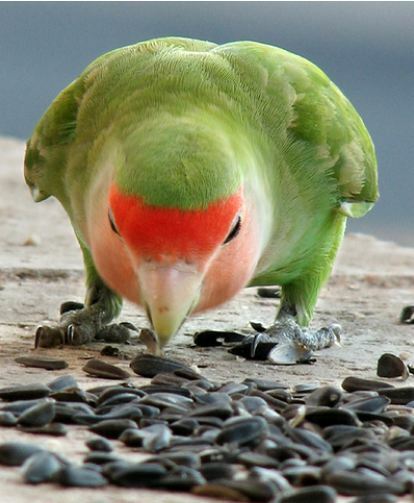 Not only is the general climate of the lower salt river valley perfect habitat for them, but the urban habitat which has built up in our valley cities as well, leaving the peach-faced lovebird population of Phoenix, AZ the only known population of these birds in the country. Parrots living in cities isn’t a new phenomenon here in the U.S. Florida, Texas, and coastal California all have flocks of wild parakeets and other parrots which thrive in both urban and wild environments but these species require moister environments and just can’t survive in the hot dry climate that is the Sonoran Desert, and this is all the better news for the peach-faced lovebird who doesn’t have to share it’s branches with competing species. The future of the Peach-faced lovebird looks great. It would appear their population is self-sustaining and not wholly dependent upon humans. Furthermore, it is believed that any attempt at eradication of these birds would not only be misguided but doomed to fail. Not only is the Peach-faced lovebird perfectly at home here in the valley of the sun but has shown absolutely no negative impact on any natural species or systems. Apparently, they slid seamlessly into our ecosystem and neighborhoods and have become model residents. I only wish I could say the same thing for Californians. Look for this guy in the suburbs, neighborhood, and parks. They frequently nest in the holes of our Saguaro Cactus and live at the edges of the mountain preserves. For more information on our local residence please see these wonderful sites. I have between 2 and 20 visit me twice a day, every day. It’s wonderful!